Angus McTern is respected by the men of his clan and adored by the women. He takes his duties as laird seriously and has everything he wants in life—until Edilean Talbot shows up. Breathtakingly beautiful and born of privilege, Edilean needs Angus’s help to reclaim the gold she inherited from her father. The treasure is bound for America, but when Angus tries to seize it, he’s accused of kidnapping and theft and has to leave behind all that he knows to escape with Edilean to the new country. There they discover almost insurmountable obstacles, and a love as wild and free as the land itself. The second book in the multi-generational Edilean series that began with the contemporary novel Lavender Morning, Days of Gold is filled with humor, passion, and adventure. Stirring and masterfully rendered, this is Jude Deveraux at her best. This reading group guide for Days of Gold includes an introduction, discussion questions, ideas for enhancing your book club, and a Q&A with author Jude Deveraux. The suggested questions are intended to help your reading group find new and interesting angles and topics for your discussion. We hope that these ideas will enrich your conversation and increase your enjoyment of the book. 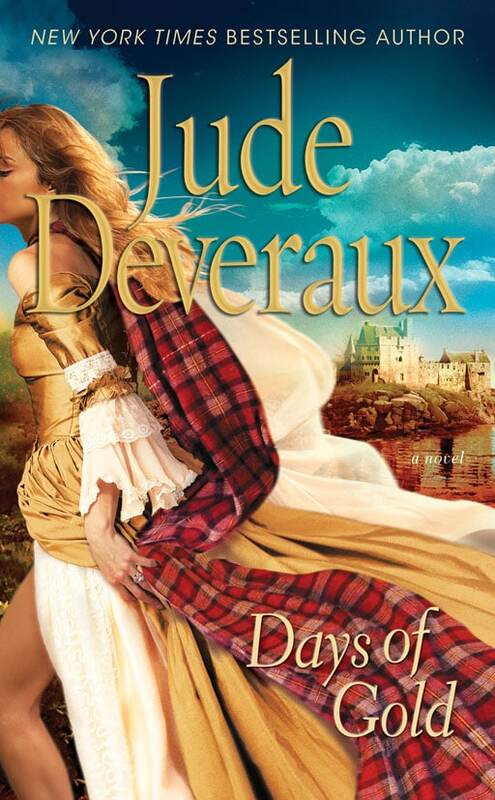 Jude Deveraux continues her Edilean series in Days of Gold, set in eighteenth-century Scotland and later in colonial America. Angus McTern is the laird of a Scottish castle, committed to overcoming his grandfather’s disreputable legacy by looking after each member of his beloved clan, which remains in thrall to the tyrant who won the castle. Angus is a Scot of honor and solitude, revered by men and adored by women. But when the tyrant’s niece, a young heiress named Edilean, takes refuge within the castle walls, Angus’s life is forever changed as he becomes entangled with the young girl and is unknowingly roped into a mission to keep her dowry out of her greedy uncle’s hands. As the pair begin to fall deeply in love, Angus and Edilean must weather catastrophe and betrayal, and begin a relationship that spans continents, years, and colonies. 1. Do you think Angus has transformed into an upper-class man by story’s end? Is he still the rough-and-tumble McTern of McTern, or has he changed? 2. Consider the tyrants in the story (Lawler, James Harcourt, and Colonel Austin). Did each villain get what he or she deserved? What did you think of James’s ultimate fate? 3. What did you think Angus was up to in the weeks he was missing after the “disposal” of the body? Were you certain he would return? 4. Discuss the romantic relationships in the narrative: Edilean and Angus, Malcolm and Harriet, Shamus and Prudence. Which romance surprised you the most? Which do you think is filled with the most passion? 5. Consider Edilean’s evolution. Has she transcended her dainty, privileged upbringing by story’s end? Discuss her Bound Girls business, her fight with Tabitha, and her use of artillery. 6. Do you think Angus was justified in leaving Edilean that night in the tavern? Should she have gotten some say before his disappearance? Were you surprised that she forgave him? 7. How did you perceive gender roles in Days of Gold? Consider especially the women in the story, and the various hardships they endure (Edilean is betrayed, Tabitha is branded, and Harriet is blackmailed). Have the women of Bound Girls transcended their lower station in the story? Have the all the rugged Scotsmen been tamed and taken down a notch? 8. What do you think kept Angus and Edilean apart for so long? Why couldn’t they just give in to their love? 9. Will Tam find love in Williamsburg with Abigail Prentiss? Will he return to Scotland to be a laird? 10. What do you think the town of Edilean, Virginia, will be like (prior, of course, to Lavender Morning)? 1. Read Deveraux’s Lavender Morning, the first in her Edilean series. Compare and contrast the subjects of these historical romances. Where do you see the narrative connections? 2. Angus sketches Edilean’s dream house during the boat ride to America. Try to make a rendering of your own ideal estate, barns, bairns, and all. 3. Look at some other famous instances of cross-class romance (such as Cinderella or Edith Wharton’s House of Mirth). What recurring themes do you see in literary class struggles? What makes Days of Gold different? 4. Visit www.simonandschuster.com and watch/read the Vook for Jude Deveraux’s Promises. How does the combination of prose and video/picture affect your reading experience? Discuss what the Vook for Days of Gold would be like. 5. Along similar lines, cast your picks for which actors would play which characters in your Days of Gold movie. Q. Did writing Days of Gold require a lot of research on the period? Describe your process for writing historical romance. A. Prior to Days of Gold, I’d written several books that took place in that same time period, so I had already compiled a lot of information before I had even started this book. But I had to do quite a bit of specific research, such as about the Ohio Company and markets at the time. And, of course, I had to find places for my characters to live. I have to have floor plans for wherever the people are, whether it’s a mansion, an apartment, or a ship. When they go out the door, I need to know which way they need to turn to get out. It’s the same for roads. If they drive somewhere, what road do they take? What do they see along the way? Sometimes, weeks of work result in only half a sentence of description, but I need the research to be able to visualize what I’m writing about. Q. Was it frustrating to keep Angus and Edilean apart for so long? Why is Angus so stubborn in allowing his love for Edilean to surface? A. I felt it was a long period in real time, but not pagewise. Angus truly and deeply loves Edilean, which means that he wants what is best for her, not for him. If it had been up to him, he would have taken her back to Scotland and lived in that tumbling-down old castle. But that would have made her miserable. He just didn’t realize how deep her love was for him. So, no, it wasn’t frustrating at all. They both needed the time apart. And I wanted an excuse for Shamus, Tam, and Malcolm to return to the story. Q. Which would you recommend reading first in the Edilean series? Days of Gold or Lavender Morning? A. They are stand-alone books. I don’t like to read books where I feel as though I’ve stepped into the middle of things and don’t know what’s going on. I like to see characters I’ve met before, but I don’t want to feel left out because I haven’t read other books in the series. Q. Are you working on another book in the series? If so, what period will it be in? If not, what period would you like to write about next? A. I’ve written two more books in the series, one contemporary, one historical set in the 1800s called The Scent of Jasmine. I just finished Scarlet Nights, which is about Sara Shaw and Tess Newland’s brother Mike. It was great re-visiting the people I’d met in Lavender Morning. Sara’s mother was great fun to write about, and I never did figure out if Mr. Lang was a good guy or a bad one. I’m now in the middle of a contemporary about Colin Frazier and I’ve written about fifty pages of a historical set in 1893, called The Scent of Jasmine. At the end of that story, Angus’s sons showed up and I was dazzled by them, so I may do some books about them. I plan to write lots more Edilean books as I really and truly like these people and I want to find out more about them. Q. Do you feel the women in the story transcend how men perceive them? Was there any sort of historical reference for the Bound Girls? A. Yes. It always astonishes me that people think the generation before them were chattels to men and never did anything in the way of business. It is so ridiculous! Yes, more women stayed home in the past, but they also ran companies. When a woman’s husband died, whom do they think supported the family? Q. This story is one of personal evolutions. Do you consider Edilean and Angus to be significantly different by the story’s end? Have they met somewhere in the middle, or simply learned to accept each other for what they are? A. The big change was that Angus and Edilean had to learn about each other. In a way, Angus was so hung up on Edilean’s background that he couldn’t believe she was capable of loving someone like him. He was a bit of a snob, really. As for Edilean, she thought she was useless, and needed to find out that she could do something other than host a tea party. She needed to transcend her own wealth and beauty. Q. Shamus, Malcolm, Tam, and Angus all end up in different locales with their respective women by the end of the story. Which is the greater bond: love or clan? A. Shamus, Tam, and Angus stayed in Edilean and founded the families of the town. Only Malcolm returned to Scotland. As for love or clan, I think they’re both the same. The clan stays together out of love. In a way, the clan moved to Edilean. Q. Between Angus’s drawings of Edilean’s dream house and Edilean’s renderings of Angus’s shaven/unshaven face, there is a large amount of drawing and illustrating within the story. Do you do any of your own art while writing? A. My university degree is in art and, yes, I do a lot of drawing for all my books. I have a big drafting table set up in a spare bedroom and I cover it with maps and house plans and sketches that I use in the books. Also, I truly love architecture so that plays a big part in all my books. Q. Is there more to the reasons behind Angus’s absence in the weeks after James’s death? Are there secrets still yet to be discovered? A. In a book I finished some time ago, The Scent of Jasmine, about Angus and Edilean’s daughter, I tell that the Ohio Company never paid off. I don’t know if anyone will notice the reference, but it meant that horrible old Colonel Austin went broke. Q. Which was your favorite character to write? And will Edilean ever see Morag again? A. I really liked Shamus and Prudence. I was so glad those two misfits found each other. They could have lived truly awful lives if they hadn’t run across each other. That Prudence, whose father was an earl, would marry a nobody like Shamus said a lot about her. I loved the way at the end that Shamus told Edilean the truth, that he would have stolen her gold—and that he never planned to be nice to Angus. As for Morag, she stayed in Scotland and I think she was too old to be a continuing character. But she may turn up if I send one of Tam’s kids back to Scotland.